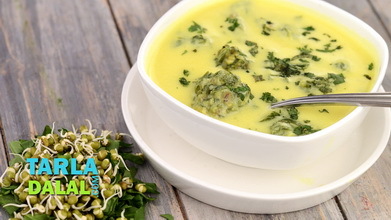 Freshly prepared pakodis of besan perked up with coriander, green chillies and green chillies are floated in a mouth-watering kadhi. 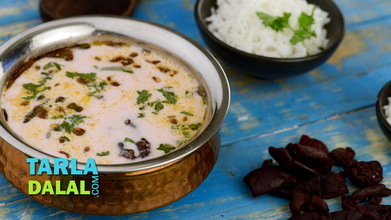 The kadhi is quite richly flavoured with an assortment of spices ranging from cloves and cinnamon to fenugreek and coriander seeds, and the pakodas are an added attraction that make the Punjabi Pakoda Kadhi thoroughly irresistible! 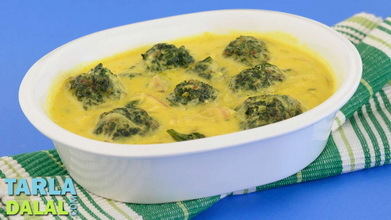 Make sure you simmer the kadhi for just a minute or two after adding the pakodas so that they absorb the flavours but do not become soggy. Combine all the ingredients along with approx. 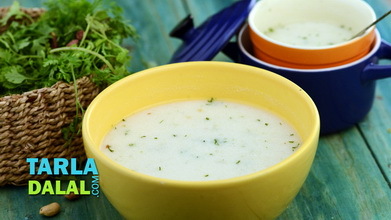 1/4 cup of water in a deep bowl and mix well to make a thick batter. Heat the oil in a deep non-stick pan and drop spoonfuls of the batter into the hot oil and deep-fry a few at a time till they turn golden brown in colour from all the sides. 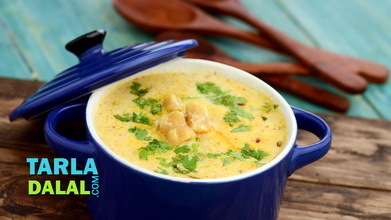 Combine the curds, besan, turmeric powder, salt and 2 cups of water in a deep bowl and whisk well using a whisk. Keep aside. Heat the oil in a deep non-stick pan, add the cumin seeds, cloves, cinnamon, fenugreek seeds, coriander seeds and kashmiri dry red chillies and sauté on a medium flame for 1 minute. 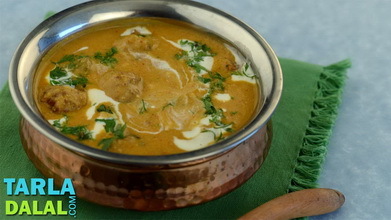 Lower the flame, add the curds-besan mixture, ginger-green chilli paste, chilli powder and a little salt, mix well and cook on a slow flame for 8 to 10 minutes, while stirring occasionally. Keep aside. 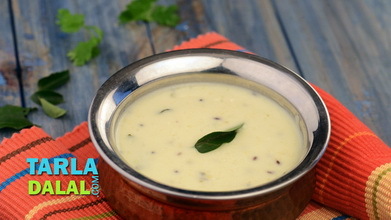 Just before serving, re-heat the kadhi, add the fried onions and cook on a medium flame for 2 minutes, while stirring occassionally. Add the pakodas, mix gently and cook on a medium flame for 5 minutes, while stirring occasionally. 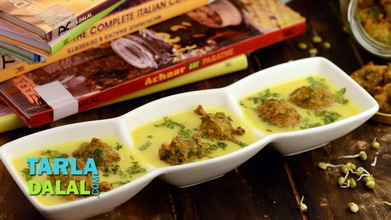 Serve the punjabi pakoda kadhi immediately garnished with coriander.